Who knew a gritty film could be boring? Most films with a visceral style of realism explore heavy subject matter and use unconventional filmic techniques to captivate audiences – not necessarily in a pleasant way, but in a way that is thought-provoking, or engaging at the very least. 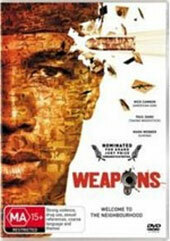 Weapons is one such film that isn’t afraid to explore the issue of gun violence through experimental methods of filmmaking. But in its boldness, it blows effectiveness and originality into smithereens, leaving nothing but a bloody mess of uneventful drama. Sean, Jason and Chris are three young friends who live in a shady neighbourhood – one where a black eye is the perfect justification for a personal vendetta, guns are easy to come by and dope is passed around openly. In just the space of one weekend, a series of destructive events occur as individual actions all culminate in a dangerous mix of misunderstandings, jealous impulses and revenge. As the kids of this neighbourhood seek solutions through gun violence, they are thrown into deeper consequences that leave them feeling shaken and lost. Sequenced without a chronological order, Weapons tells a story of irrational violence through an interesting mix of visual and audio techniques that deliberately rupture your sense of stability and comfort. Having said that, the way in which these techniques are used throughout the film is as irrational and disordered as the emotions of an angst-ridden teen. With one segment of the film completely shot in a shaky hand-held camera, the scene roams through a party from the perspective of Chris’ eyes as he intends to make a film, capturing the trashy underbelly of the teens in his neighbourhood. While this style of story-telling could potentially be original and exciting, Weapons chooses to tap into the drunken stupor of teen scandals that aren’t compelling for the audience, lingering for too long on mundane conversations and certain visual effects such as slow motion that achieve nothing but boredom. Much of this dullness, however, is associated with the fact that the characters are flat and uninteresting; meaning no amount of visual experimentation is enough to make the story compelling or worth the audience’s attention. The use of sound and music is also rendered ineffective as a result of this. While much of the music is used to sustain a particular atmosphere and feel to the neighbourhood, there are also jarring sound effects that are intended to heighten tension and the surreal tragedy that eventuates from the extremity of teen emotions. But due to the weak story and characters, the soundscape isn’t as powerful as it could have been, turning the combination of visual and audio styles into an effect that falls short of what it aims to achieve. While the film’s story is completely centred on events that significantly correlate with one another, Weapons feels surprisingly uneventful due to its uninteresting characters and its concentration on the dull and mundane aspects of unwholesome teen life. The twists to the story are predictable, the script is poorly written and the execution is no more exciting, so that the film’s potentially powerful and engaging editing is made superfluous and ineffective. Weapons will splatter your brains with tediousness.